I will be investigating and explaining the ways in which the business I have chosen, called Extreme Hair Team, could improve the promotion element of its marketing mix. 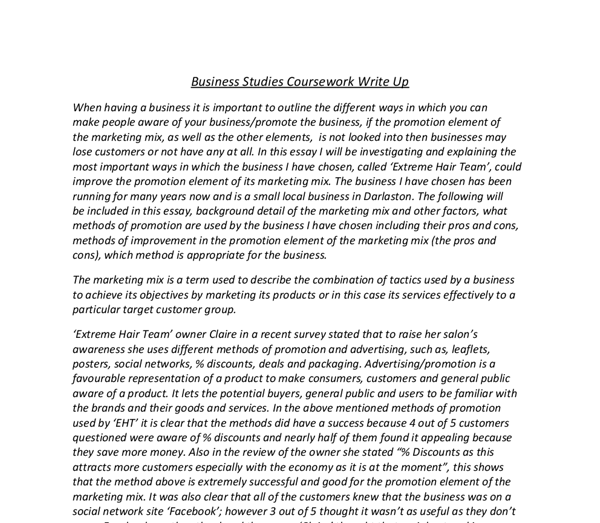 ﻿Business Studies Coursework Write Up When having a business it is important to outline the different ways in which you can make people aware of your business/promote the business, if the promotion element of the marketing mix, as well as the other elements, is not looked into then businesses may lose customers or not have any at all. In this essay I will be investigating and explaining the most important ways in which the business I have chosen, called ?Extreme Hair Team?, could improve the promotion element of its marketing mix. The business I have chosen has been running for many years now and is a small local business in Darlaston. 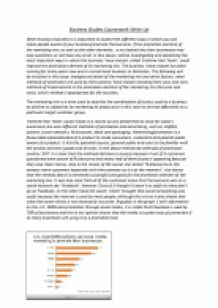 The following will be included in this essay, background detail of the marketing mix and other factors, what methods of promotion are used by the business I have chosen including their pros and cons, methods of improvement in the promotion element of the marketing mix (the pros and cons), which method is appropriate for the business. The marketing mix is a term used to describe the combination of tactics used by a business to achieve its objectives by marketing its products or in this case its services effectively to a particular target customer group. ...read more. To remain competitive, businesses reach these potential customers using organic SEO to obtain good placements for their website and social media properties. Paid Search Ads ? In addition to organic placement and content creation, businesses purchase advertisements that display their products and services in search. In the pie chart (graph 4) it is clearly visible that 70% of people using the internet use organic links and not the paid, this shows that it is a greater way to raise business awareness and help improve the promotion element of the marketing mix. When these search engine marketing ads are linked to a well-designed marketing website the results can be spectacular. However there is still an argument over whether organic online placement is better, in my opinion I think it is because it?s free, more traffic (80% clicks) and it?s longer lasting. Although there are different methods of promotion, I think the following various methods will help to improve the promotion element in the marketing mix for the ?Extreme Hair Team?. The ?Referrals? method is effective, Word of Mouth marketing will be the most powerful, cost-effective and effortless marketing you can take advantage of for increased business and profits. ...read more. Before: We do Facials After: Our Facials will rejuvenate your Skin, Leaving it Looking Radiantly Healthy and Feeling Absolutely Fabulous. Every word in every single message, advert and presentation forms a perception, either good or bad. Choose your words wisely. Too many salon and spa owners study what the competition is doing and do and say the same. Make you words count; make them unique, succinct, persuasive, enticing, juicy and delicious. To conclude, in my opinion, I think that a Niche Strategy and Blogging should be used for the business I chose because in both the methods it is clear that there are a lot of successes and few disadvantages. The ?Niche? is better than other methods because you don?t have to spend a lot of money and it could help to increase repeat purchase which will then help increases ales and hence boost profits. Lastly Blogging could help improve the promotion element because it is a better way than other social networking sites; it?s easily accessible for people of all ages. Also personally I feel that Facebook is not as expressive because fake accounts are usually created and this can lead to misinterpretations with a customer and a business, so blogging is the new way forward for the ?Extreme Hair Team?. ...read more. A good advertisement will, include: a meaningful job title, a salary or salary range and details of where the job will be based. It is helpful to include a brief paragraph outlining the main responsibilities of the role and the skills and experience required. Another aspect that is also followed up by the finance management is; * Paying Electricity Bills * Heating / Air Conditioning Bills * Machinery Maintenance costs * Gas Bills All businesses need to pay their bills, utility bills are their primary sector of a business - without it, and nothing really is possible. This has brought Cadburys more profit and has improved Cadburys global status as a chocolate industry. This will help achieve the aim 'Profitably and significantly increase global confectionery share', as Cadburys are investing into a product, which they know is successful all over the world and therefore the extension products should also be popular all over the world. This could be very time consuming for employees at Ginsters, this would mean that work productivity decreases. This is a way that current legislations will affect Ginsters as they have to carry out these health and safety evaluations, this could mean that Ginsters are losing profit as a direct result of work productivity decreasing due to less staff. Many others departments may be involved in providing information for multimedia purposes but this largely depends upon what it is the organisation wants to focus on and communicate The purpose of web based information at my chosen organisation: Web based information is a type of information system or software that normally uses internet web technology to deliver information. If ASDA was to have higher price on a certain product and it was cheaper in Tesco the customer will automatically but it from their as it is worth their money. ASDA will need to compare their prices with competing stores and make strategic decision on how to better their pricing without losing profit.